RSS feed Subscribe to our RSS feed. What is a RSS feed? Twitter Follow @PIETeam on Twitter. 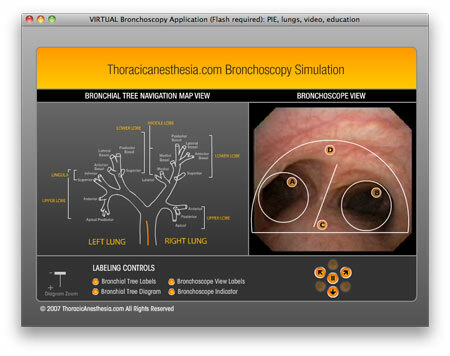 The Virtual Bronchoscopy website has been launched! Welcome to Toronto General Hospital Department of Anesthesia and Pain Management's Visual Interactive Resource for Teaching Understanding And Learning Bronchoscopy (VIRTUAL Bronchoscopy). This Web site is being developed under the guidance of Dr. Peter Slinger, staff anesthesiologist and Professor in the Department of Anesthesia at University of Toronto. Dr. Slinger has a major interest in thoracic anesthesia, and in particular the management of the airway during lung surgery. Click on the image above to open the introduction to the Bronchoscopy Simulation. This site is being launched with a simulation that Dr. Slinger developed with clinical collaborators Dr. George Kanellakos and Dr. Geoff Dugas, and software development and design by Kris Karski. Over the coming months, this Web site will be expanded with a library of video clips of bronchoscopy recorded during a variety of procedures which illustrate a wide range of pathological conditions. All contents copyright ©2008 - 2012 University Health Network. All rights reserved.